This article reports on preparations for the Sheepshead Bay board track’s 1916 Astor Cup auto race. 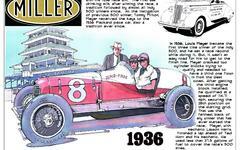 This article mentions Johnny Aitken’s success on the Cincinnati board track and at the Indianapolis Motor Speedway’s first and only “Harvest Classic.” Gil Anderson and Dario Resta are also mentioned in this article. This article discusses entries for the September 1916 Astor Cup. Defending champion Gil Anderson had been seriously injured at the Cincinnati Speedway board track and could not enter. By the time this article was written, 19 cars were entered including Peugeots for the two top drivers of the season, Dario Resta and Johnny Aitken. Sheepshead Bay board track management had made the decison to shorten the race from the previous year's distance of 350 miles down to 250. A commensurate reduction in the purse accompanied the shorter race cutting the 1915 purse in half from $50,000 to $25,000.